South West Coast Path - Peppercombe to Bucks Mills - You can start this walk from Bucks Mills, which has car parking facilities, or Horns Cross on the A39 between Bideford and Clovelly. 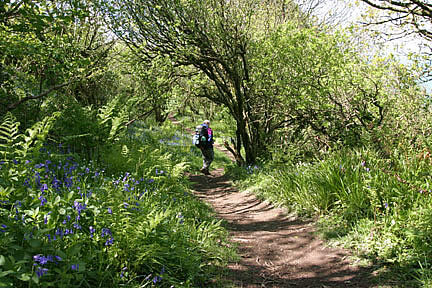 The photographs here depict the walk starting from Horns Cross which is about 139 metres above sea level and takes you down through Peppercombe Valley. Take the right trail through the gate with the National Trust sign and follow the path about a mile down, passing by the pink cottage and onwards until you come to the big copper beech by the old stables. 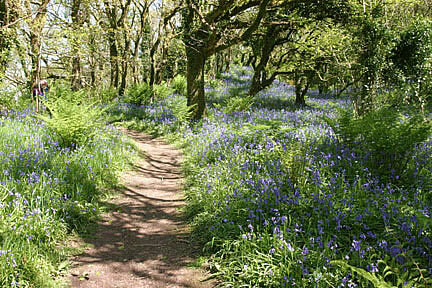 The gate to the right leads you onto the coast path westward to Greencliffe and Westward Ho! To pick up the coast path to Bucks Mills, which is about 3½ miles from here, carry on left over the bridge and start your ascent at the first set of steps to the left. "Ascent" best describes this section which twists and turns rising from about 79 metres above sea level from the start to 133 metres at its highest and 55 metres at its lowest, heavy going with a pack or rucksack! 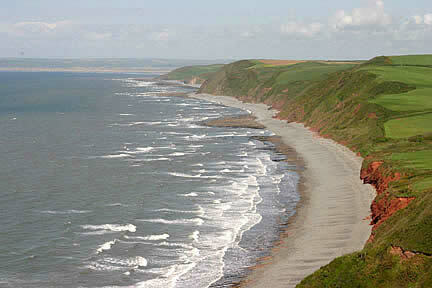 This part of the national trail does not afford the awesome views of other sections of the North Devon Heritage Coast. This is great if, like me, you are a little afraid of heights, however, there are a couple of good vantage points on the way up where you can take in some stunning views of Bideford Bay. 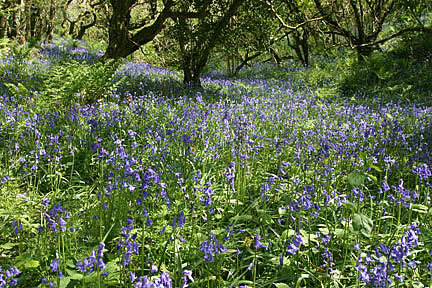 The best time for this walk is in May when all your efforts will be rewarded with the breathtaking bluebell displays at each new plateau as the trail winds upwards through Sloo and Worthygate Woods. Although it is a good path through the woods and mostly away from the cliff edge, it can be a little narrow and muddy in parts, especially on rainy days, so great care must still be taken. On reaching the top the path emerges from the woods with pastures on the hillside to the left and a grassy clearing to the right with views across to Gallantry Bower and Hartland Point ahead and glimpses of Peppercombe and Greencliffe behind. At this stage it is wise to remember the climb up before you decide to continue and make the very steep descent into Bucks Mills. 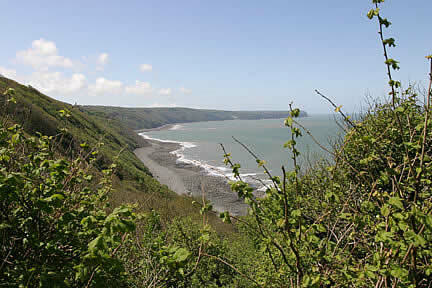 Hardened coastal walkers can pick up the coast path again at Bucks Mills and carry on to Clovelly or, if you prefer, there are connecting trails which lead you back to Horns Cross via Northway or via the "Green Lane" which both run parallel to the coast path. The walk benefits from newly appointed signposts.